I am wearing a toile de Jouy / wedgewood print sundress by Primark. Straw bag by Le Voyage en Panier. What a weekend it’s been for Britain: Andy Murray won the tennis, the first British male to win the tournament in 77 years, the Lions beat the Aussies in the rugby. And the best: Temperatures shot up to 29 degrees, blue skies and happy people everywhere. Let’s just say that this wonderful weather is quite a rare occurrence during the summer months here! 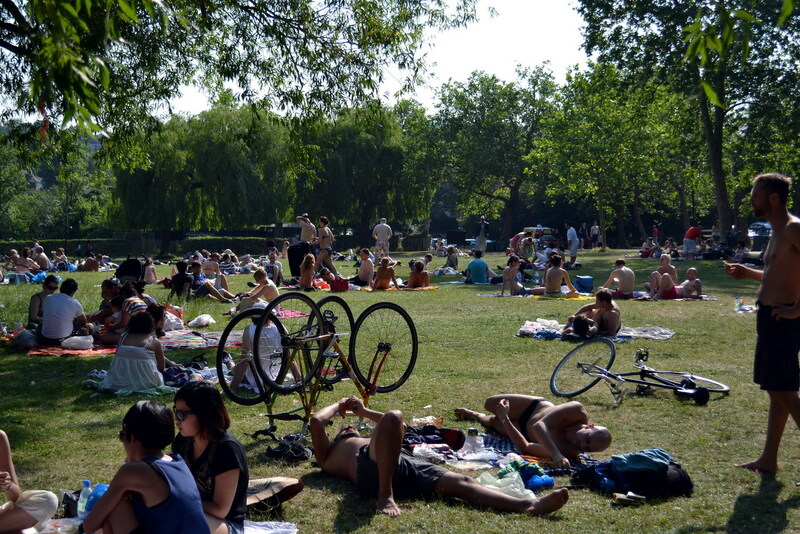 No wonder that people made the most of the sunshine: London’s parks were jam packed. Mr Romantique and I headed to London’s North, Hampstead Heath. We managed to get a small square of space by the small swimming pond. I must admit I did not swim in the rather brown, muddy waters shared with various ducks and other wildlife! 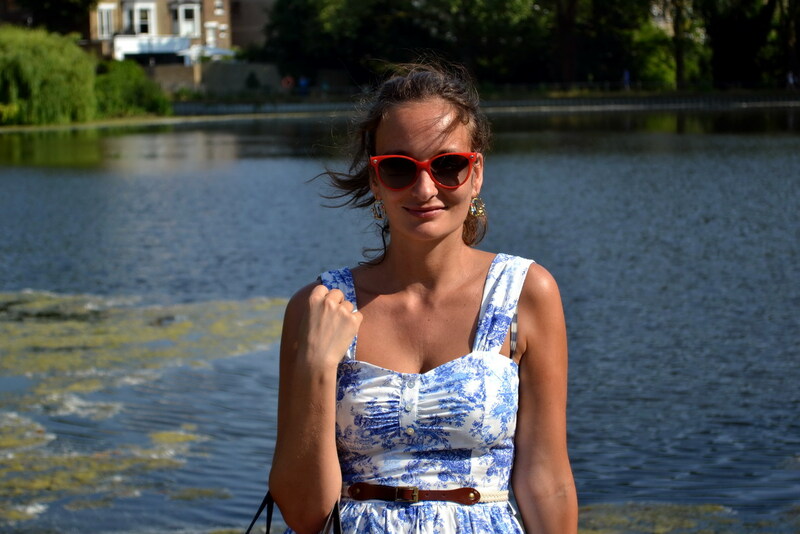 For the summery occasion, I chose to wear a cotton sundress by Primark in Toile de Jouy print. 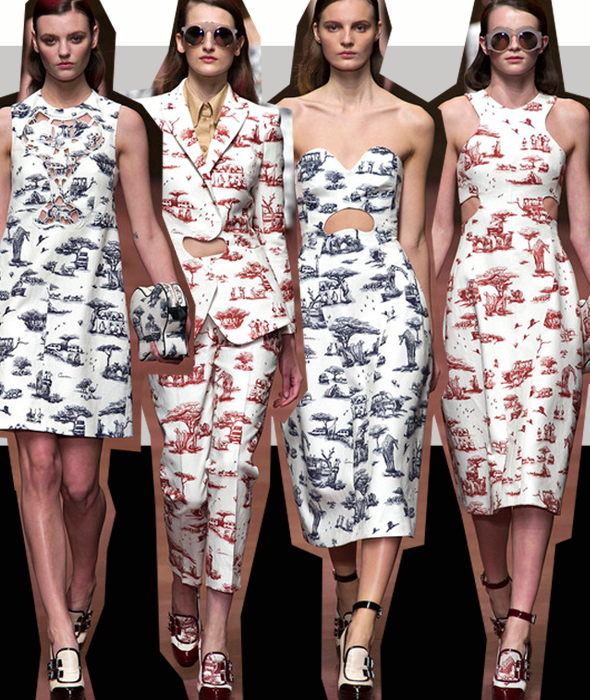 You might have seen this design of landscapes and figures for which the 18th-century factory of Jouy-en-Josas, near Versailles, Fr., was famous at Carven’s SS2013 runways, reinterpreted with Safari prints. While I am a fan of sustainable, well made and high quality garnments, I think there is nothing wrong with a little trendy cotton sundress made to wear for one season. 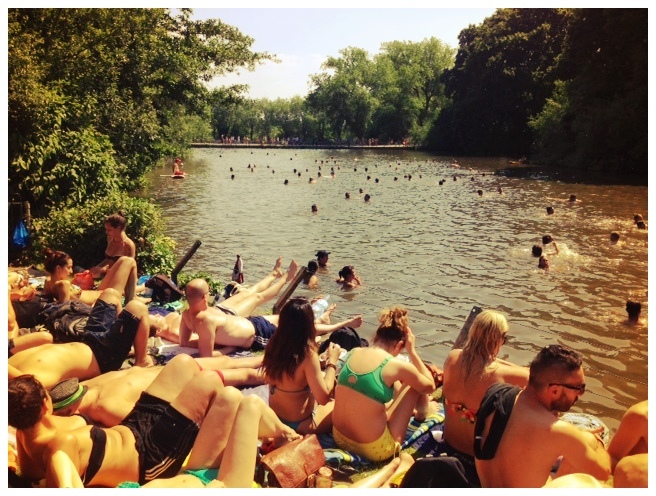 Hampstead Heath swimming pond. If you’re claustrophobic, rather chose the airy hills of the surrounding heath! Dress for less: Primark is a great place for trendy pieces copied straight off the runway. This dress only cost a fraction of the original from Carven.